I just love a simple dessert… one you can whip up on a moments notice, one that requires a minimal of ingredients, and even better, one that doesn’t require turning on the oven! 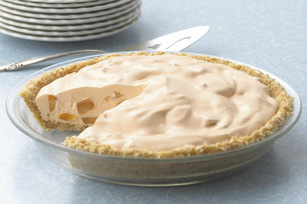 This pie is extremely easy yet wonderfully rich. It’s great served with a cup of strong brewed coffee and it’s the perfectly rich chocolaty dessert for a dinner party. It can be made “fat full”, light or fat free depending on the ingredients you buy and the taste never wavers. In a glass measuring cup, break up the chocolate pieces and add the milk/cream. Microwave on high for 30-45 seconds, or until chocolate melts. Stir to combine. In a large bowl, put the softened cream cheese, add the melted chocolate and blend until smooth and well combined with electric mixer. Fold in the Cool Whip and combine well. 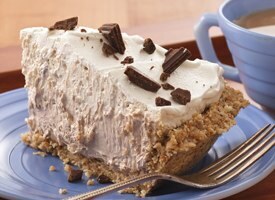 Pour into graham cracker crust, top with chocolate shavings or pieces, and put in the freezer for at least 1 hour. To serve, let soften just enough to slice. Serve with fresh brewed coffee for a perfect, chocolaty, rich dessert.